It's from a music video that I never finished, but I'm glad I finished the Max Headroom scene! Don't mean to brag, but I 100% Krokotopia in Wizard101. Bet you can't beat that! I recently tried out "Tomb Raider: Definitive Edition", but I don't know what everybody is talking about. The gameplay is mostly quicktime events and it runs poorly with frequent frame drops. So... is it like smash? Alright that seemed to work, thanks. Could someone post their signature code. I'm clearly the only one having this issue. Even though I wasn't up until this point. Topic: whats your favorite Mario game? Re: whats your favorite Mario game? Super Mario Bros: Another One. Effing A! I didn't even know this was a thing. I just made a video making fun of Nintendo making several consecutive "Deluxe" editions for switch, but I thought it was coincidence. This is really getting out of hand. I like new games. Whatever happened to new games. My next album is coming out soon, Lord of the Flies. I worked pretty hard on this album cover, what do you guys think? What can I improve? Hey, man. I was just browsing the forum and I just happened to notice that the images in my signature had turned into text hyperlinks. I can't seem to fix the problem. I think this might have something to do with the new PostImage integration. Topic: What is your favorite Mario universe character? Re: What is your favorite Mario universe character? 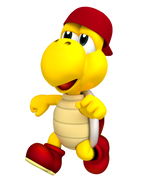 Koopa Troopa all the way and back home, bro! Aw, MAN! It's gotta be Mario's Picross! Love that game!! Topic: My New Album is Out! "NORGIB: The Show! Vol. 1"
My New Album is Out! "NORGIB: The Show! Vol. 1"
Wow, ladies and gentlemen! This art thread has quickly turned into a heated debate on "#NotAllDeviants". My name is Daine Esvang and I will be your commentator for this event.